Last November a new streaming TV service called "Philo" was announced, aimed at providing a much cheaper monthly cost for users by cutting out all sports-related content. Starting at $16 per month, subscribers can stream 37 entertainment networks on multiple devices including iPhone, MacBook, Roku, smart TVs, and more. At the time of its announcement the company said a Philo app would be coming to Apple TV, and now CEO Andrew McCollum has confirmed that the Apple TV app for Philo will be launching this summer (via CNET). Alongside the launch window for the Apple TV app, McCollum revealed that the service will also allow subscribers to unlock the streaming apps for TV networks included in their Philo subscription. Much like DirecTV Now, this means that if users pay to stream a channel like AMC on Philo, they can use their Philo log-in within the AMC app to access paywalled content. This will be a bonus for Apple TV owners, since most over-the-top live TV streaming services don't support Apple's TV app, but many individual network apps do. In addition, you'll be able to do more with your Philo account. The company is unlocking the streaming apps for the TV networks included in a customer's subscription. That means if you pay for Philo's $16-a-month bundle of cable channels, you'll be able to access the paywalled apps for channels like AMC, Nickelodeon, Discovery Channel and History. Philo's $16/month tier provides access to 37 channels, including A&E, AMC, BBC America, Lifetime, TLC, Travel Channel, and VH1. There's also a $20/month option that increases the channel count to 46, adding in options like Logo and Nicktoons. Philo's entertainment-focused lineup lacks sports, live news, major broadcast networks, and local channels -- all of which help lower the monthly cost of the service. 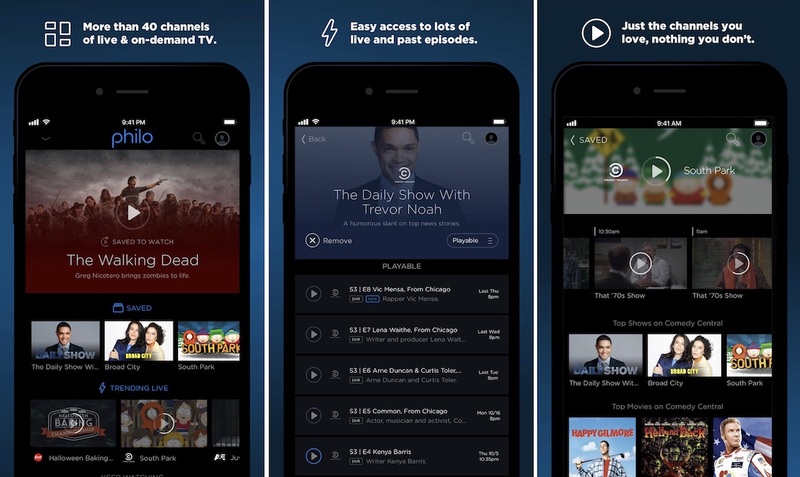 On the channels offered by Philo, subscribers can record live TV and set recordings on future episodes to watch later, with space lasting for 30 days. In terms of streaming, Philo lets users stream on up to three screens at once in HD. Comparatively, rivals like Sling TV start at $20/month for about 25 channels, DirecTV Now starts at $35/month for about 60 channels, Hulu with Live TV starts at $40/month for about 50 channels, and PlayStation Vue starts at $40/month for about 45 channels. All of these services include sports or have an option to add on sports content for an additional monthly cost. ESPN itself has launched its own over-the-top streaming package called ESPN+, focusing on live sports, original shows and films, studio programs, and an on-demand library of content. ESPN+ costs subscribers $4.99/month or $49.99/year, and is pitched as a companion service to other ESPN channels and cable packages since it lacks some major live TV content, like games in the NFL and NBA. I cut my family off from the idiocy of live TV. I told them anything they want to watch can be found on Netflix/Hulu/HBO/Starz/Prime/iTunes. If they can't find it there, tell me and I'll find it somewhere. But you're not watching commercials. Television advertising is poison, especially to impressionable people like all children and some adults. No longer in my house is there a TV playing endlessly in the background with a litany of propaganda streaming into everyone's thoughts. I definitely don’t want to pay for sports content, especially when major networks have the only sporting events I’d care to see anyway, but every subscription of this type needs to include the top 4 major networks to be successful. That being said this is probably good for those who can get ABC, NBC, FOX, CBS over the air. I'm always happy to see more competition in the streaming space. At present this offering isn't particularly useful to me - I've got cable internet, and Comcast tacks on their "limited" channel package for a very, very low price (probably so their falling subscriber numbers don't look even worse). But if Comcast ever stops doing that, or if I move to a different internet platform, something like Philo would be appealing. Get Silicon HDHomeRunPrime and a Comcast cable card. If you can get locals via antenna, get HDHomeRun Quad or similar. Then, Channels app for :apple:TV. If you like DVR functionality, add Channels DVR for that app. This combination will give you cable television + locals on all TVs in your home via :apple:TV boxes + (optionally) a real DVR for all those TVs, all controlled within a nice, unified on-screen guide. If you or others watch on mobiles, either the Comcast app or a dedicated Channels app for mobile can bring all that to your mobile devices too. It's a really good option for your situation. Maybe one day we’ll be able to pay for a service and not have it overrun with ads (this is utterly bizarre in my mind; every other service I use, I pay to remove ads). If TV actually had anything I wanted to watch, and if shows weren’t getting shorter every decade to make room for more ads, I’d be interested. I think these two things are related: the kind of person who is okay with paying for content that still has ads is not the kind of person who’d be interested in watching the kind of things I want to see. Your wish already exists and has for many years. Most everything one wants to watch is in the iTunes store, available to rent commercial-free. So why aren't all the "you's" doing that? Because they don't want to pay the price for commercial-free programming. A lot of us tend to see commercials as an intrusion, but they are also a subsidy: other people- those running the commercials- paying the various parties that make & deliver the shows instead of passing along the total cost directly to us consumers. That is not so different than buying $600-$1000 phones for $0-$200. How? The companies selling the service traditionally subsidized the "rest" of the cost. Now we consumers are somewhat programmed to think phones should cost about $0-$200 and we thoroughly scoff at $600-$1000+. In other words, we want the subsidized pricing, perhaps even seeing that as "fair" pricing for phones. But the parties that make the phones want to be paid what they want. A few "channels" have long offered what you seek. For example, HBO has long been "commercial free" (unless you count their own). And that has traditionally cost $10-$20 per month for just a few "channels" of HBO programming and movies. HBO is popular but not hugely popular. Why? Possibly because people don't want to pay that much for commercial-free HBO. That's the issue. What a lot of people want is cheaper than they've traditionally paid AND commercial-free. All the other players in the chain want to make MORE money, not less. That can't be resolved without something having to give. If the masses ever move on that want and refuse to pay until they get it, quality and breadth & depth likely has to fall substantially. Imagine youtube-type programming where the show writer is also the actor is also the director is also the producer, etc. Bottom line: either the consumer masses pay and/or there is some kind of subsidy model to make it so those masses can pay less directly... OR something else has to give. There is no magic solution to this problem... any more than whining about $1000 iPhones and expecting Apple roll them out for $200 without a subsidy model. This was a reminder to me that people are very different. The biggest issue preventing me from cord cutting is access to sports. Apparently, there are quite a few "anti-me's" around. And this is why I subscribe to Playstation Vue. Would it not be for live sports, my wife and I would be completely fine with just Netflix, Hulu, Amazon Video and HBO. We have been using Philo for a little over a month on a Roku 3. It works perfectly, has NEVER skipped or cut out, and the DVR functions are amazing. Previously, we had tried out DirecTV NOW on Apple TV 4k and also Hulu w/ Live TV on Apple TV 4k. Both of those services are AT LEAST 2x as expensive. DirecTV NOW was ***awful*** -- we actually bought another service even though we'd pre-paid for a few months of DirecTV NOW. It skipped constantly, the interface was awful, the DVR beta never worked, it didn't let you fast forward through ANYTHING or pause... it was the worst. Hulu w/ Live TV was great, but too expensive at around $60. Philo gives us everything we want for $16 a month. It's quick, it works perfectly, and best of all you can fast forward through commercials on EVERY show in your DVR (some VOD shows don't allow FF, but most do).